Old and new, big and small, we rig them all! Downrigging the Falls of Clyde. 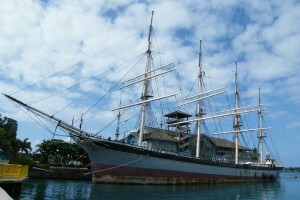 The Falls of Clyde, the last surviving iron-hulled, four-masted, full-rigged ship. 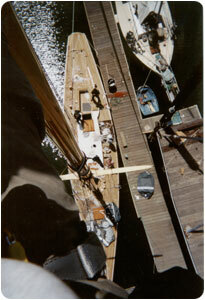 A view from aloft on the Joyant, a 58′ 1911 P-Class Herreshoff racing yacht. 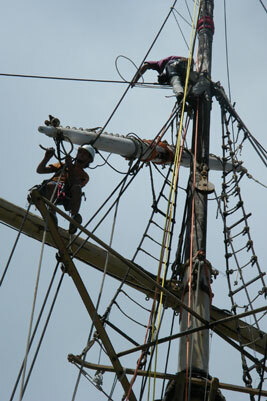 All rigging engagements are preceded by a rigging survey. The survey will assess your boat’s current rigging systems, including running rigging, standing rigging, masts, mast head, mast step, spreaders, stays, sheets, travelers, reefing, furling, and chainplates. All surveys include a trip to the mast head, a service that sets us apart from many surveyors. An in-depth examination will be made of shrouds and metal hardware checking for fatigue, crevice or galvanic corrosion, and general metallurgical qualities. The owner is not required to be present but must arrange full access to the vessel. Surveys generally require about two hours at the vessel. Any additional time required will be billed at the quarter hour at our standard consulting rate. The survey will generate a written report and free review of our findings along with any recommendations, regardless of whether or not any additional services are engaged or required. Contact us to schedule an initial consultation by filling out the form below. Or, call us at 360.385.1080 or e-mail rigging@briontoss.com and we will get back to you as soon as possible. If emailing, please include your boat’s rigging details and any appropriate photos along with your preferred start and end dates. $ 325 – 425 * Single-mast -LOA under 40 ft.
$ 425 – 625 * Double-mast -LOA under 40 ft. Boats over 40’ are charged by the hour over the two hours allotted for survey. Assessment of your boat’s current rigging systems – including aloft, running rigging, standing rigging, masts, mast head, mast step, spreaders, stays, sheets, travelers, reefing, furling, chainplates… your entire rigging system. In depth examination of shrouds and metal hardware, targeting metal fatigue, crevice corrosion, galvanic corrosion, and quality of metallurgy. A written report and free review of our findings along with recommendations. Once the survey is complete, post-survey consultations, billed by the hour, are available for clients who require an even deeper level of information. The onboard portion of a survey can be accomplished in two hours. Additional time billed by 1/4 hour. Owner need not be present for survey. EMERGENCY rigging work of any kind = time and one half. Optimal Rope-to-Chain Splice – $ 90 -180 Please bring your chain to our shop – in a travel/dock cart is best. Or, we will come to your boat – on board splicing is more time consuming – though sometime’s necessary. These are estimated costs at BTYR shop rates – We charge by the 1/4 hour – does not include travel. Washington State law regarding overtime labor applies to all our jobs.